Hey, all you Apple fans, ask you one question. 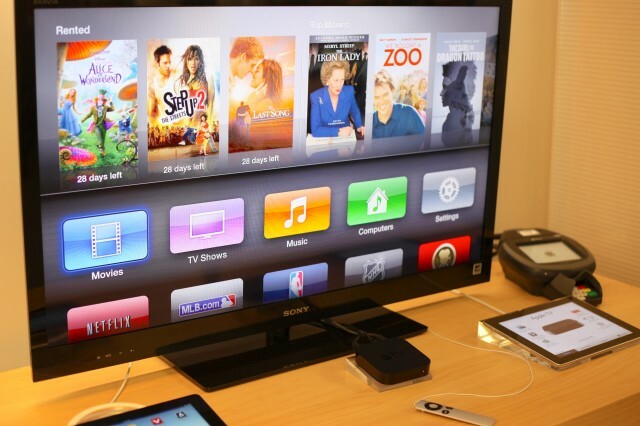 What are you using for about Apple TV you own at home? Do you want to improve your entertainment life at home? If you have no idea about this issue, you have to read this article. Apple TV is a digital media receiver and a small form-factor network appliance designed to play digital content originating from the iTunes store, YouTube, Flickr, MobileMe or any Mac OS X or PC in an enhanced-definition or high-definition wide-screen television via iTunes. With the newest Apple TV- 3rd generation launched, iPhone, iPad and iPod can sync the content to Apple TV 3 via the great AirPlay function for streaming videos or photos in Apple TV. This article will show you a detailed guide about how to stream videos from iPhone/iPad/iPod to Apple TV. Want to know other Video and Audio Options? In order to be an easy understanding guide, we will show you 4 parts separately. 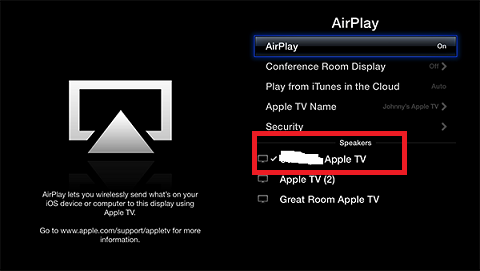 For most users, you may know AirPlay function of Apple TV, but are you sure that you really know “AirPlay”? Actually, there are three conceptions about AirPlay: AirPlay, AirPlay Mirroring and Peer-to-peer AirPlay. It depends on devices you have and the function of the three “AirPlay”. iPhone 5 or later, iPad (3rd generation or later), iPad mini, or iPod touch (5th generation) using iOS 8 or later. Apple TV (3rd generation rev A, model A1469 or later) with Apple TV software 7.0 or later. Find out which Apple TV model you have. Let’s say if you have an iPhone 6 now, and here the guide will show you how to stream videos from your iPhone 6 to Apple TV. 1. Connect your Apple TV to a big screen and LAN(Local Area Network) in your home. 2. Open your iPhone 6, press “settings” – “Wi-Fi ”- choose the same network connected to Apple TV in the first step – enter the password and connect it with iPhone 6. Until now, your iPhone 6 is sharing the same LAN with Apple TV. This point is very important. 3. Put your forefinger on the bottom of your iPhone and slide from down to the top gently, “AirPlay” button will appear in Control Center. 4. Press “AirPlay” to choose the device that iPhone 6 will stream to. Normally, your Apple TV will be in the device list. Then you will see your iPhone 6’s screen is streamed to Apple TV now, then you can open any video in your iPhone 6 and it will stream to Apple TV directly. As how to use AirPlay Mirroring and peer-to-peer AirPlay, the difference between AirPlay we can know from their functions and supported devices we talked above. Refer to AirPlay Mirroring and peer-to-peer AirPlay part, if you have one of those iOS devices, you can use AirPlay Mirroring or peer-to-peer AirPlay. 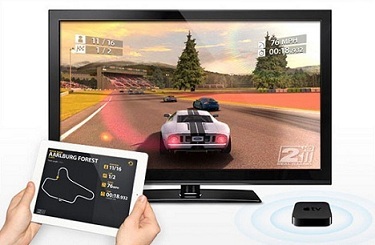 After you know how to stream iPhone to Apple TV, how to stream from iPad to Apple TV will not be a big problem for you. Just the purpose of a iPad user may like to take iPad as a controller when he playing video games. That’s really cool. Please refer to the steps of how to stream iPhone to Apple(Part 2). 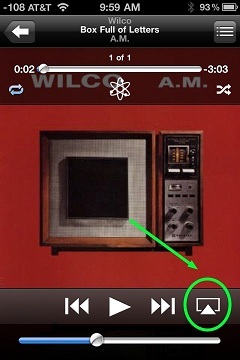 iPod is more used to play music by Apple users, just make sure the speaker and receiver can be applied in AirPlay. Buy AirPlay-enabled speakers at the Apple Online Store. Please refer to the similar steps of how to stream iPhone to Apple (Part 2). If you are rocking with an Android device, you can experience the same easy-to-use goodness of AirPlay, thanks to the following top 10 streaming apps. You can also use AirPlay with iTunes. If you want to stream tivo, mxf, mts, mov format videos to Apple TV 3, you can use an Apple TV 3 video converter, see the detailed steps.